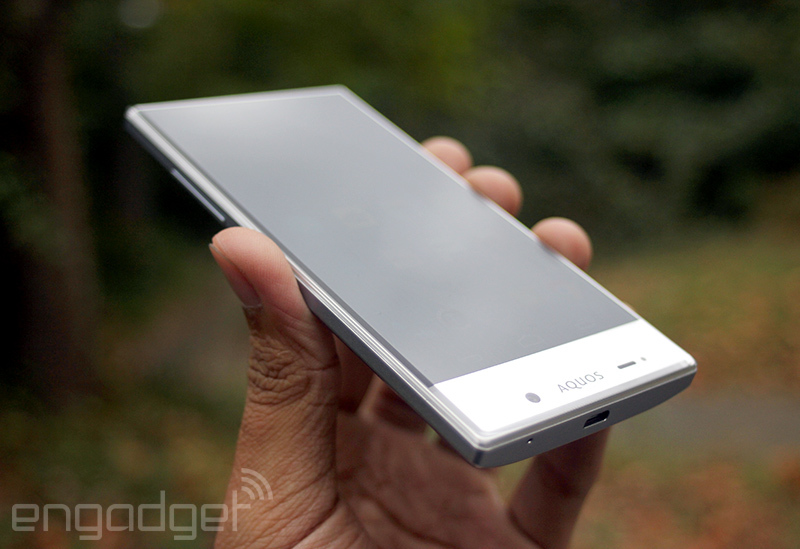 Pop quiz, hotshot: When’s the last time you saw a Sharp phone in the United States? The Sharp FX from years back? Maybe the FX Plus? If you’re anything like me, your mind will hearken back to chunky clamshell classics like this one. 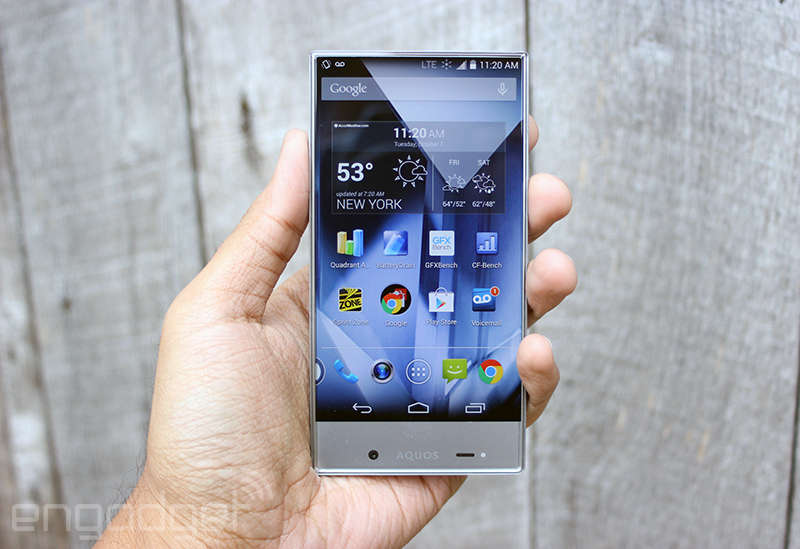 Long story short, it’s been ages since Sharp has had any kind of mobile presence around these parts. That’s something the Japanese company is finally ready to change, and it’s aiming to do it with a splash. 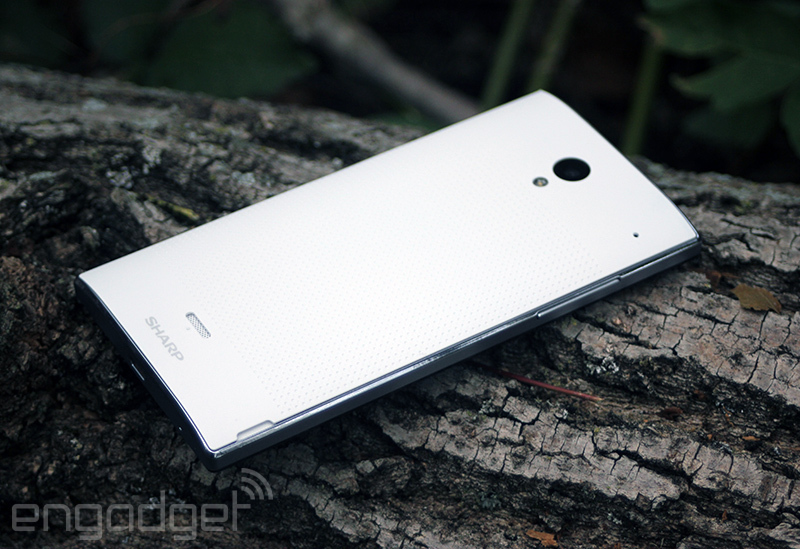 Enter the AQUOS Crystal, one of the most striking phones you’ll ever see. It’s finally available for $149 on Boost Mobile now and Sprint will get it come October 17th, but we have questions — so many questions. 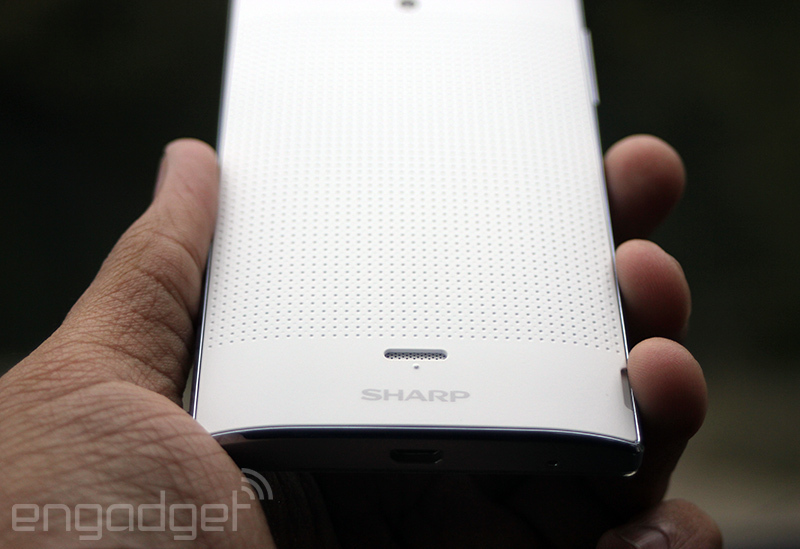 Has Sharp figured out a way to crack the all-too-fickle US market? Are we looking at a classic case of style over substance? The AQUOS Crystal is Sharp’s first phone to land in the US in ages, and it’s a looker thanks to that amazing screen design. It isn’t just handsome, though: The Snapdragon 400 ticking away inside gives it enough oomph to keep up with most people’s daily grinds. 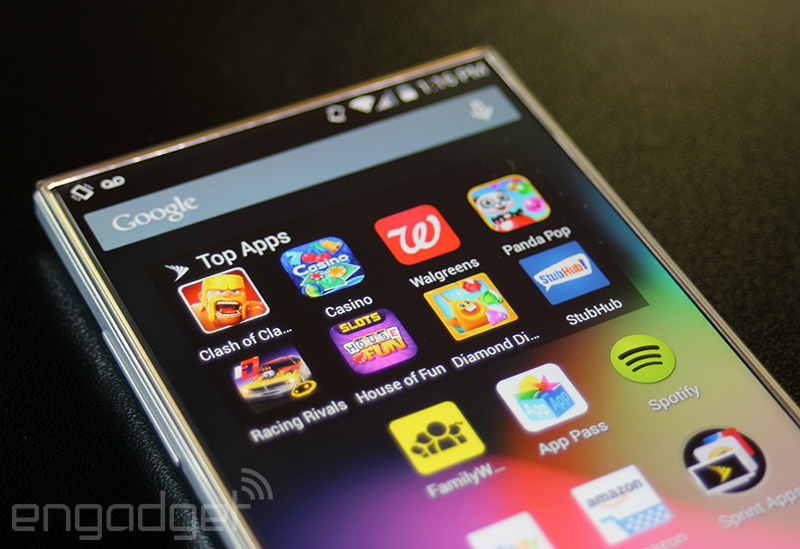 Alas, if you’re not a fan of Sprint, you’ll have to look elsewhere for your bezel-less phone fix. 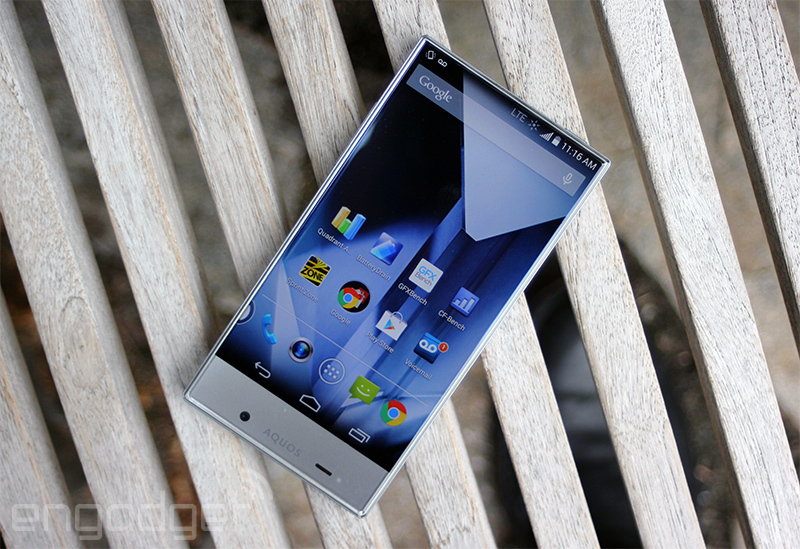 Let’s just get it out of the way now: The AQUOS Crystal looks fantastic. It’s the only phone I’ve ever tested that prompted random bystanders to either gawk or give it a double take as they walked by. One look is enough to reveal why: Those people were ogling the 5-inch 720p screen sitting up front… and more specifically, the lack of just about anything surrounding it. Squint hard enough and you’ll see just the faintest hint of a bezel running around the screen, so small that it may as well not be there. The effect is utterly striking — it feels like you’re holding some sort of J.J. Abramsian Star Trekfloating-screen prop in your hand instead of a smartphone you can buy from a store right now. It isn’t long before you notice why the Crystal earned its name, either. The glass covering the screen is angled at the edges to look like some sort of precious stone, an effect that’s usually more obnoxious than neat since it creates a pair of distracting rainbow lines where the material angles sharply. That gemstone motif informs the rest of the phone’s design, too: It’s mostly hard angles and flat edges, making the gently curving back the only real concession to comfort you’ll find. Still, since there’s hardly any cruft taking up space around the screen, the Crystal feels surprisingly small when you’re holding onto it — in fact, the HTC One M8 and Samsung Galaxy S5 feel downright unwieldy in comparison. Since a full seven-eighths of the phone’s face is nothing but screen, Sharp had to get creative when it came time to load it up with the usual accoutrements. Take the Crystal’s earpiece, for instance: There isn’t one. Well, not a traditional one, anyway. Rather than try and squeeze one in above the display (and ruin that lovely floating effect), Sharp included what it calls a Direct Wave Receiver that essentially turns the entire front glass panel into an earpiece. It’s hardly a new concept — Kyocera’s been playing with the idea of speaker-less phones for a few years now and Google Glass has a bone-conducting transmitter — but Sharp’s solution sounds better than you might think. Meanwhile, the 1.2-megapixel front-facing camera is actually located in a silver expanse along the bottom edge of the phone’s face, which some of you will know is definitely not prime placement for selfies. The rest of the Crystal is decidedly sparse: The 8-megapixel camera and LED flash sit high on the phone’s rear, amid a sea of dimpled, white plastic that forms the removable battery cover. Underneath that lies the (sadly) non-removable 2,040mAh battery, with nano-SIM and microSD card slots nestled right above it. Turns out that latter addition is pretty crucial, since it will let you add up to 128GB of storage to a device that only comes with 8GB of space (only about four of which you can use right out of the gate). When it comes to the brains of the operation, don’t let the premium looks fool you: We’re working with a pretty modest spec list here. There’s a 1.2GHz Qualcomm Snapdragon 400 thrumming away inside that plastic frame, paired with 1.5GB of RAM and a CDMA/LTE radio — nothing terribly new, nor astonishingly snappy, but not a bad choice considering the Crystal’s cheapo price tag. It’d be pretty stupid of Sharp to use a subpar screen when it removed nearly everything that could possibly distract you from it. Thankfully, it’s got the chops to make some impressive displays, and the 5-inch LCD panel it crammed into the Crystal doesn’t disappoint. First, the elephant in the room: Yes, the screen only runs at 720p, and no, that’s not a bad thing. It’s plenty bright when you need it to be and colors are well-saturated, though whites aren’t as crisp and blacks aren’t as sumptuous as they are on more premium devices. Still, pictures and videos pop when there’s no border restraining them — even poking through your email feels just a little wondrous. Alas, that screen ain’t perfect. My biggest niggle comes to the fore when you look at the Crystal’s screen from an angle. This isn’t an issue with viewing angles; your face could be perpendicular to the display and you’d still be able to make out what was going on without much trouble. No, there’s actually some prominent light leakage going on at the edges of the panel. It’s not so noticeable on the longer left and right edges, but there’s enough light bleeding through along the screen’s top side that my eyes couldn’t avoid gravitating there when I was indoors (the power of the sun usually overpowers it). Distraction? You bet. Dealbreaker? Probably not. I’m not sure how widespread this issue is, or if it’s even avoidable given how the screen is laid out. Still, it’s a mild annoyance at worst and it’s even more tolerable considering how much the phone’ll set you back. Sadly, the audio side doesn’t quite live up to the (pretty high) bar the screen has set. Sharp (and Sprint, I’m sure) have tried to augment the Crystal’s musical chops with Harman Kardon’s Clari-Fi and LiveStage audio-enhancing tech. I’ve taken both featuresfor a spin in the past, and there wasn’t much new to report back here. Clari-Fi once again does a fine job of livening up your audio tracks by sharpening mids and highs and enhancing vocals, but that all really comes down to the song you’re listening to — some will sound vastly improved; others will hardly change, and you probably won’t notice any of those software-enhanced nuances the minute you get on the subway. And what of LiveStage? I still can’t for the life of me understand why anyone would bother to turn this on. In a perfect world, the feature would add reverb just so and tweak tracks to make them sound as though they’re being performed in front of you. Instead, it adds a bit of aural distance between the layers of a song and almost always makes them sound worse. Maybe my ears, battered as they are thanks to years of loud Japanese rock, just don’t get it. I’d wager yours won’t either, but hey — it’s not a dealbreaker. And, of course, none of those features even work without headphones plugged in, which is sort of a shame considering the single rear speaker is purely average when it comes to pumping out the jams. The speaker’s wimpy muddiness is pretty much par for the course for a budget smartphone, which, while unavoidable, is still a bummer. 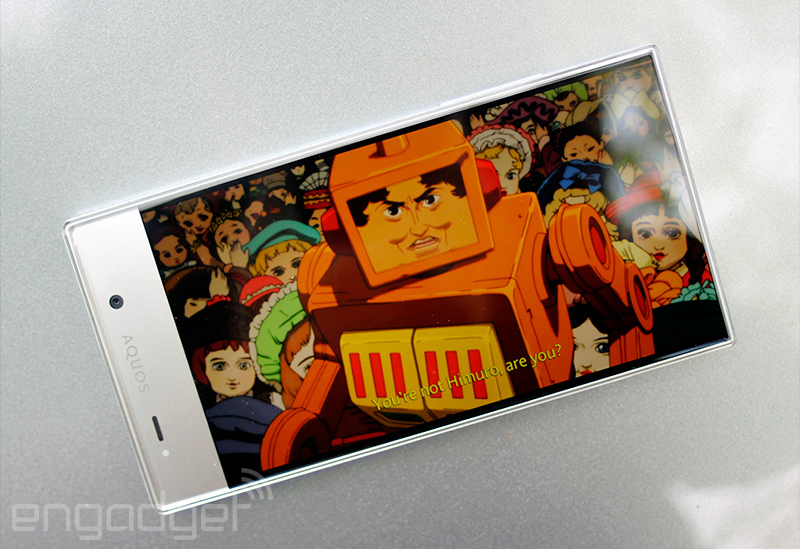 I (like many of you, I suspect) am an Android purist. Shocker, right? 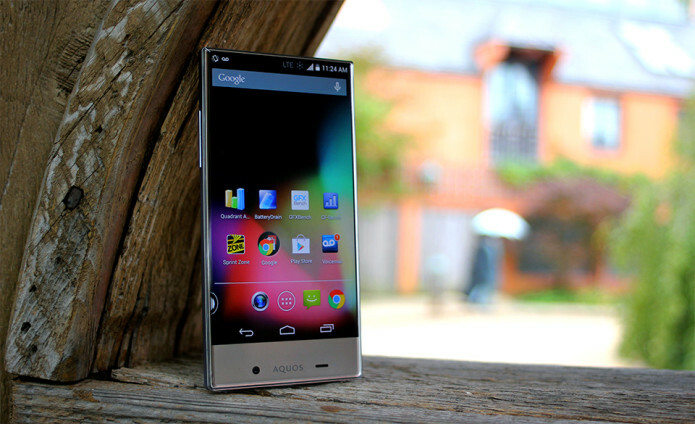 Thankfully, Sharp hardly futzed with Google’s OS before throwing it on the Crystal: It runs a pretty clean build of Android 4.4.2… that just happens to be festooned with all the extraneous Sprint apps you could think of. Upon first boot, I was greeted by a preloaded AccuWeather widget on the home screen, a Sprint featured-apps widget on another and no fewer than 20 additional apps and bolt-on services that the carrier decided I needed to have. Fortunately, most of those bright yellow Sprint icons are merely pointers to listings in the Google Play store, which means they’re easy to dismiss with extreme prejudice. Not all of them are useless cruft, though: MobiSystems’ Office Suite 7 contains solid document and spreadsheet apps, and NBA Game Time and NASCAR Mobile are easily accessible if you’re into ballers and racers, respectively. There’s also a pretty impressive Siri/Cortana analog in the form of Speaktoit’s Assistant app (yeah, its branding could use a little work) that’ll read you the day’s top headlines, translate languages and let you check in on Foursquare in addition to the de facto slew of virtual assistant tasks. What few bits Sharp did add are centered on the screen; so-called Frameless effect settings allow you to enable visual notifications that surge across the display. Meanwhile, an additional screen lock will kick in once you initiate or pick up a call just to make sure your cheek doesn’t accidentally hang up on your friends for you. Hardly the fanciest things you’ll ever see, but surprisingly useful all the same. Every phone maker is guilty of cutting corners with cameras at least once (especially with mid-range phones for the masses), and Sharp is no different. The main imaging attraction is an 8-megapixel rear camera that mostly churns out soft, grainy, under-saturated shots, even when there’s a seemingly sufficient amount of light bathing your subjects. Take it into the great outdoors on a bright day, though, and things start to improve a bit — you’ll be able to pick out just a little more detail in your photos, but the end results are still rarely worth getting worked up over. If anything, I’m fonder of the equally lacking 1.2-megapixel front-facing camera because it’s quirky and isn’t where it should be. As mentioned before, it sits at the bottom of the Crystal’s face — in order to take a selfie that isn’t 90 percent neck and chin(s), you’ve got to turn the Crystal upside-down. Honestly, it sounds like much more of a hassle than it actually is (though the repeated visual reminders of everything going on south of my face are a little disturbing). Anyway, it’s good enough for a Skype video call or a group Hangout; just don’t expect to snap any masterpieces with it. As usual, both cameras will record video (with resolutions maxing out at 1080p and 720p for the main and secondary shooters, respectively). Surprise, surprise: Video doesn’t come out so hot either, as it’s laden with grain and the lens takes a bit longer to switch focus than I’d like to see. It’s actually kind of a shame the two sensors are so lackluster, because the camera UI packs in a few neat tricks to help you snap better photos. 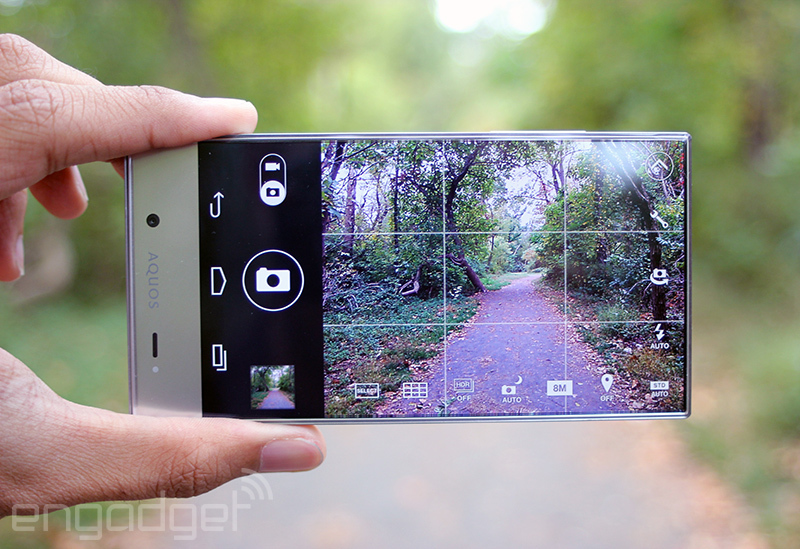 All the usual settings like HDR mode, geotagging controls, ISO and white balance are present and accounted for, but a framing guide displays patterns on the Crystal’s screen so you can better line up your photos. Oh, and if you’re a nerd who often takes pictures of computer screens (not that we’d know anything about that), a Flicker Control setting counteracts the annoying refresh rate that manifests as those dark bars that run down displays. You can dismiss those settings with a single touch, while another snaps a fresh new photo, though there were a few (very rare) occasions when I had to tap the screen multiple times to make the Crystal understand I wanted to take a photo. The screen will garner most of the attention, but let’s not forget about how this thing runs. As I pointed out earlier, the AQUOS Crystal uses one of Qualcomm’s 1.2GHz quad-core Snapdragon 400s (more specifically, the MSM8926). It’s nothing if not a known quantity by now; it was first revealed over a year ago and has powered devices like Motorola’s LTE-friendly version of the Moto G and LG’s G2 mini LTE. Consider that a roundabout way of saying it’s not too hard to guess how smoothly the Crystal operates: It’s plenty snappy, but easy to stymie if you’re willing to try. Rapidly scrolling through long web pages in Chrome was mostly a graceful affair, as was jumping in, out and between apps. The Crystal isn’t immune to slowdown, though — it took three seconds to launch the camera and a jam-packed notification shade would occasionally stutter when I dismissed it — but there’s enough horsepower tucked away in there to make sure it won’t leave you hanging while you’re trying to get things done. Oh, you’re a fan of numbers? The benchmark breakdown reveals, well, nothing terribly surprising. The AQUOS Crystal and Motorola’s second-generation Moto G are pretty much dead even by all counts, whileHTC’s Desire 816 (also available contract-free on Virgin Mobile) pulls ahead thanks to its slightly speedier version of the Snapdragon 400 chip. Now, regarding that 2,040mAh battery. In the standard Engadget rundown test (with the phone connected to WiFi and looping a 720p video while fetching social updates at 50 percent screen brightness), the AQUOS Crystal stuck around for a full eight hours and 46 minutes before it needed to suckle on a power outlet once more. Curiously, that’s just over an hour more than what the 2014 Moto G eked out of its battery (which is actually just a touch more capacious) when we ran it through the wringer earlier this month. Real-world testing saw some similarly strong results — my days of tweeting, taking calls, watching Sutton Foster videos on YouTube, triaging emails and playing games on the toilet were never enough to kill the Crystal before work hours were over. On average, it took just north of 15 hours to discharge the thing completely, which means enough juice for your routine and then some. 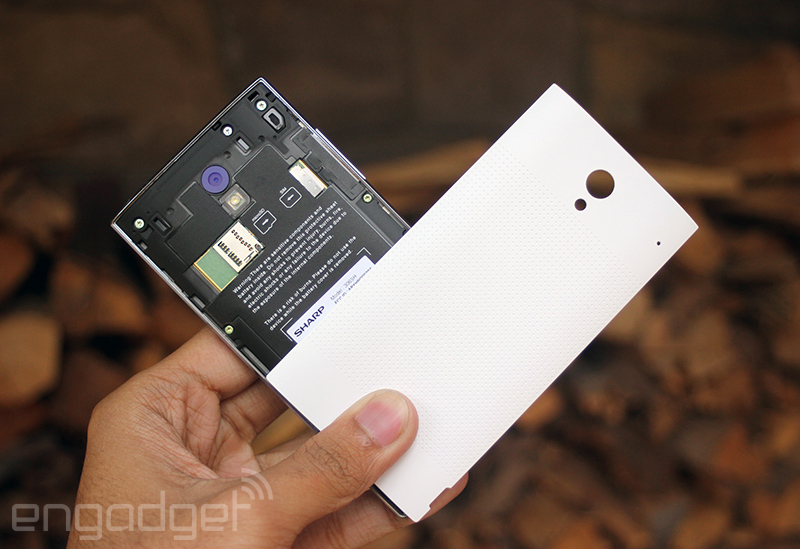 Here’s another question to ponder: How well does this thing actually work as a phone? It lacks a traditional earpiece! How crazy! In fact, the whole telephonic shebang works reasonably well — while call quality is best when you hold your ear to the top of the phone, you can actually stick it anywhere on the screen and converse the way you always do. Why anyone would choose to plop those ears smack-dab in the center of the screen to listen is beyond me, but hey: At least you’ve got the option. Alas, it’s never quite as loud as a standard speaker, and people I called weren’t terribly enthused with the somewhat quiet output they got as I spoke into the microphone. Here’s the thing to remember about the AQUOS Crystal: It’s only going to be an option for you if you’re OK inking a deal with Sprint (or shacking up with sub-brands like Virgin Mobile and Boost Mobile). Everyone else can just move along right now… unless you live in Japan, in which case I’d recommend you live a little and splurge on the Crystal’s more powerful big brother. After all, the Crystal X pairs a bigger 5.5-inch frameless display with a 2.3GHz quad-core Snapdragon 801 for added oomph. That snappy combination of style and power is a distinct step up from the version we have here in the States, and I’m frankly a little bummed that’s not the model I’m reviewing today. Anyway, let’s break the rest down by carrier. On Sprint, the Crystal costs $240 upfront to own it free and clear, which you could also split into monthly payments that get tacked onto your bill. You could feasibly consider the LG G3 Vigor (with monthly payments of $13 over 24 months), though we’re looking at a dead heat between spec sheets and I’d give the Crystal the nod if only because of style. And don’t forget the original HTC One. It’s a bit long in the tooth, but it’s got a lovely 1080p display and enough horsepower to run a circle or two around the Crystal. If you’re jonesing for some non-contract action on Virgin Mobile (where the Crystal only costs $150), you’ll have to decide whether you’d rather spend the extra cash on a HTC Desire 816. It’s bigger, and it packs a better camera and speakers, and a Snapdragon processor clocked at 1.6GHz. The downside? It costs twice as much as the Crystal. Did your wallet just groan as you read that? You could also consider the HTC Desire (actually a rebranded Desire 601), but you probably shouldn’t — you’d spend $30 more for a lousier camera and a lower-resolution screen. The Crystal costs the same $150 on Boost Mobile, where there are plenty of (less stylish) choices. There’s yet another HTC Desire in the form of the 510 that only costs $100, and while it doesn’t quite stack up to the Crystal, it’s cheap and it comes close. Oh, and in the event you’re not exactly married to Sprint’s ilk and want a similarly spec’d phone without spending a ton of money, consider the original Moto G with LTE. Sure, it doesn’t have the big screen or improved camera that its sequel does, but $219 will score you a device with the same brains as the Crystal and the LTE support none of the next-gen Moto phones have yet. Sharp and Sprint deserve some major kudos — not only did they bring a truly interesting smartphone to our shores, but also they’re pricing it to move and trying to get it into as many hands as possible. I can’t help but wish Sprint imported the Crystal’s more powerful brother instead, but hey: We have an actual bezel-less screen, and a set of guts that (for the most part) doesn’t let it down. In the end, though, here’s what it boils down to: If you’re absolutely, positively enamored with Sprint, and don’t feel the need to pay gobs of money for top-tier power, the AQUOS Crystal is definitely worth your attention. If you’re all about the non-contract lifestyle on Virgin or Boost, though, the Crystal is a steal at $150. Thanks to the dark magic of carrier-exclusivity deals, no one else need apply.